With much of the northern hemisphere coping with high temperatures and long dry spells, wildfires are affecting communities from Greece right up to the Arctic Circle, claiming dozens of lives and damaging ecosystems, homes, livelihoods and infrastructures. The Salvation Army is responding in a variety of ways, according to local needs and in partnership with other agencies. General André Cox is conscious that “the heatwave is creating chaos, fear, evacuations and loss” and calls Salvationists and friends to prayer. “Those on the front lines need our support and those affected need our prayers,” he said. Extreme heat affects everyone, but the risks are greater for young children, pregnant women, older adults, people with chronic illnesses and those experiencing homelessness. Dangerous wildfires have been burning in numerous parts of California. Salvation Army Emergency Disaster Services teams have been deployed to more than a dozen separate sites in Santa Rosa, Napa, Grass Valley, and Solano and Butte Counties. The initial emphasis was to provide meals and other urgent assistance to first responders and to residents evacuated from their homes. Now, the focus has shifted to distributing meals and providing emotional and spiritual care to residents re-entering areas that had been fire damaged. 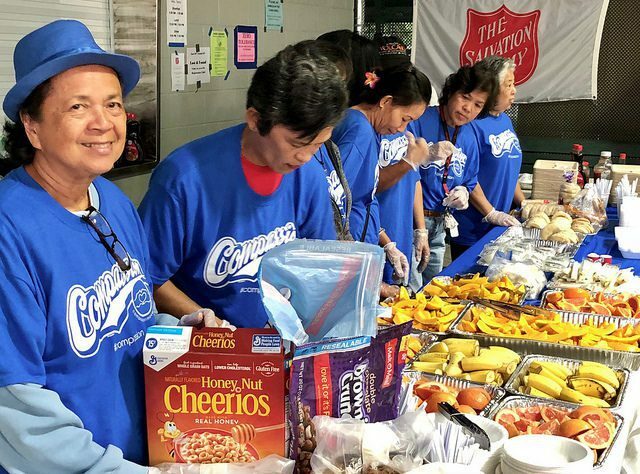 In Santa Rosa alone, Salvation Army teams have served more than 85,000 meals, provided $60,000 in gift cards and given away more than 18 tons of essential household items. Partnering with other agencies in Alpine, near San Diego, The Salvation Army has been a key provider of support at the Local Assistance Center set up to serve those affected by a wildfire that destroyed 18 structures. As well as food, water and store gift cards, emotional and spiritual care is being provided by Salvation Army officers and volunteers. 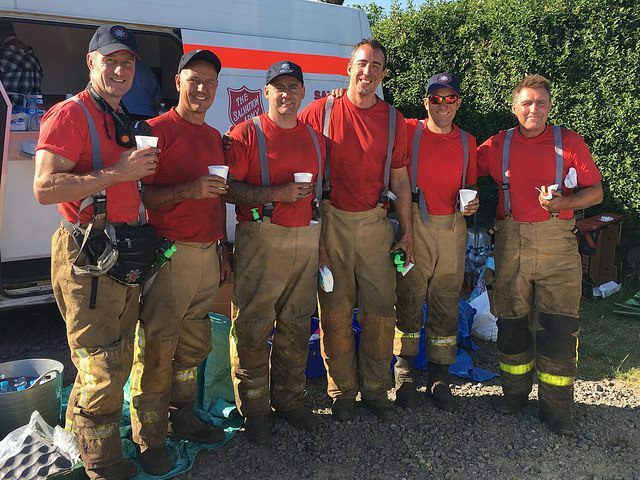 Across on the east coast—in Altona, New York—a Salvation Army team provided hydration to several hundred first responders involved in containing and extinguishing a large fire near Flat Rock State Park on the USA/Canadian border. “A team of volunteers provided snacks and water to the incident command post for distribution into the rough terrain that the first responders are operating in,” said Michael R. Schwartz, Divisional Disaster Director for the Empire State Division. Fires are also causing large-scale damage in Europe. 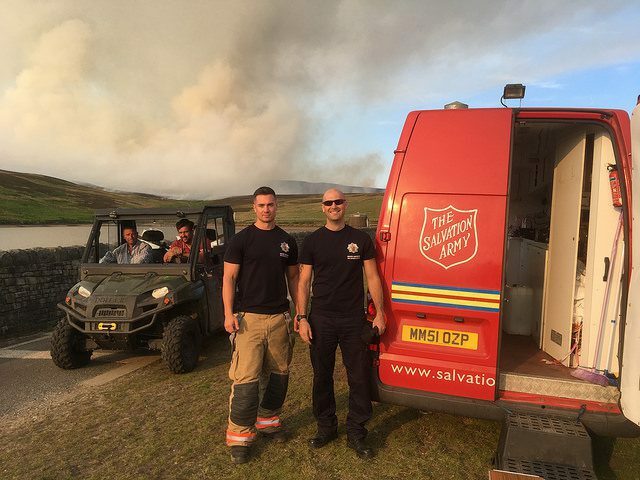 In the North West of England, Salvation Army volunteers—led by emergency response coordinator Major Nigel Tansley—provided food and refreshments to blue-light services fighting a major fire on Saddleworth Moor that took more than three weeks to put out. In the first two days of the response, The Salvation Army provided support to more than 70 firefighters, mountain rescue teams, park rangers and farmers. More than 1,000 drinks were provided, as well as 600 chocolate bars and sandwiches using 40 loaves of bread.